As I mentioned earlier, events in Volgograd have had me doing a walk done memory lane. Volgograd was my first time to travel outside the U.S. and the walk down memory lane & looking through photo albums (yes film-based camera and real prints on photo paper — sounds like a history lesson!) So what really stands out for me? A few things, some are generally about being in Russia & the trip (I spent a few days in Moscow too) and others are specific to Volgograd. This list is the more general & Moscow oriented pieces…. I was in Volgograd so long that it deserves a list of its own! Russia could be a little intimidating. I decided to make this trip and in the hubris of youth and in a space of not really seeing the big world picture, I guess I didn’t know all of the factors to consider. After I was there, I began to realize there were some challenges I didn’t anticipate. First it came in little things like landing in a foreign country speaking just a bit of the language but the lack of really understanding the world around me was a bit more unsettling than expected. Of course, it was also an incredible adventure that I truly enjoyed! I had a couple of days in Moscow before going onto Volgograd and did some of the tourist things taking an organized tour of the Kremlin and generally trying to get my internal clock shifted. My travel & hotel arrangements were government controlled. Sure, I knew the Soviet Union (aka USSR) was a communist country and that the government controlled things. I didn’t realize how that would impact travel, etc for folks like me. When I booked my travel, they assigned me to hotels telling me what I’d pay. None of this winging it or negotiating room rates we are so used to. 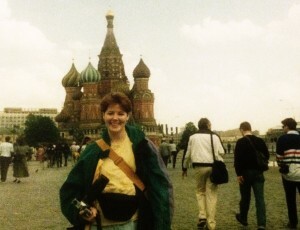 When I arrived in Moscow, I had to check in with the travel group Intourist that handled everything. They gave me a license plate number and pointed me to the general direction where I could find the car that would take me to my hotel. It was strange to me, but seemed to work well. Traveling domestically …. well that was CERTAINLY an adventure. 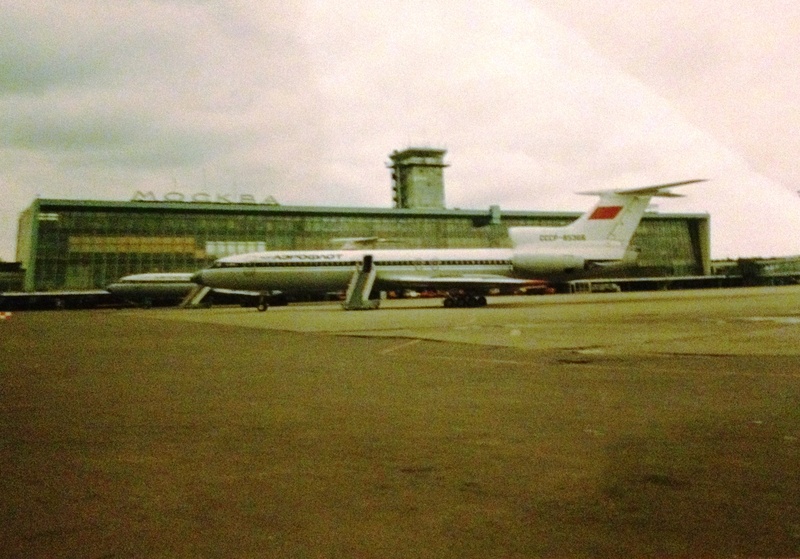 I flew Pan Am into Moscow, but I was on Aeroflot from Moscow to Volgograd. This meant going to a different terminal and as a foreigner, I was paying hard currency and getting something of a special treatment. The waiting area for us was separate from locals. I remember them calling for flights and everything was in Russian and it was fast and on bad speakers. I wasn’t sure so I asked a question & next thing I knew I was being physically pulled. I just kept asking people “is this going to Volgograd?” and getting blank stares. As I walked up the stairs at the tail of a jet, I asked the Russians there, someone finally nodded and smiled. What a difference! I didn’t think about it til later but in hindsight, after years of not wanting to be involved with American strangers in public spaces, I shouldn’t have expected the same down-home friendliness I was used to. The planes…. the biggest thing I remember is the interior wasn’t what I was used to. The seats were really thin but more importantly, the plane I was on had single panes on the windows. I was seated next to a man & his young daughter. I listened to my Walkman (music on cassettes!) & read an old People magazine to try to relax. I shared some of the snack size M&Ms and made a friend. They said we were definitely going to Volgograd & I felt a lot better. I noticed people had dogs with puppies sitting in the aisle. As we flew south, I used my fingernail to play in the frost forming on the window. Seriously. When we landed in Volgograd, the smiles of my seatmates pointing to the sign… that was memorable and so nice to know I had gotten to my destination! While I was in the USSR, there were numerous plane crashes. I didn’t know as much about that as my mom did. She told me about it when I got home. I actually felt rich for the first time in my life. I traded a couple of hundred dollars into rubles at the airport and immediately felt like I had stacks and stacks of Monopoly money! I mean a couple of hundred dollars — probably ten $20 bills — suddenly became stacks of money. I seriously couldn’t believe how many bills they handed me. And since I had prepaid for the hotels, car transfer, domestic flights, etc. Little things had more value in Russia than in the US. You can’t help but notice no cars had windshield wipers. Well, unless it was raining. See, the rubber for them was hard to come by so drivers would remove the blades except when they were needed as otherwise the blade would get stolen and resold. Seriously. That stuck in my mind. Independence is awesome and a bit worrisome. My grandmom bragged about my willingness to take on such a big adventure. I was pumped about it but realizing it was my trip, not something that I had a professor to plan, someone else to corral me, well, that did make me think twice. It also made me very happy I had Vladimir in Moscow and Sergey in Volgograd. This was the first trip during which I had to try and read areas on my own and choose what to do or not do. I met some great people during the trip including a Japanese girl named Chiaki I kept in touch with for several years after returning home. I have to say, when on my own, I was more cautious than it may have seemed. I didn’t wander through lots of neighborhoods looking for jazz clubs at night and still wonder what I missed out on but feel like I made the right choices going with my gut. 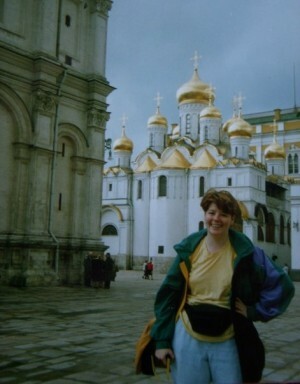 Having seen just glimpses of Russia before I went, the things that were immediately recognizable were in the Kremlin. The office buildings, St. Basil’s, the changing of the guard at Lenin’s Tomb…. those were all things that became very real as I walked the streets and sidewalks. People in Moscow were used to lots of Westerners & had a commercial spirit. At the time, the Red Army was legendary and it was amazing how many people in Moscow were finding it commercially viable to get their hands out military hats, coats, etc and sell them to tourists. 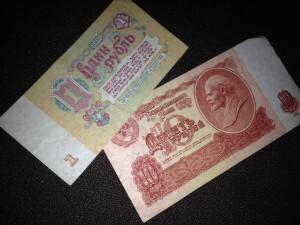 I was cautious here too but in Volgograd I had a chance to bring back a very unique souvenir. More on that in the post on Volgograd! Whole sections of town could lose services. 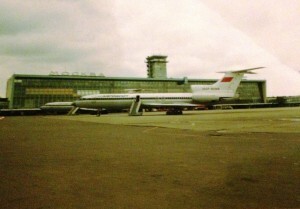 When I got to my hotel in Moscow, I had been traveling a really long time & was mentally & physically exhausted. I wanted a cold Coke, a hot shower and a nap. I got the Coke – albeit warm served with a cube or two of ice once I asked for it – and a shower that was far from hot. I came to learn that the hotel I was assigned to had no hot water and in fact, the hot water to that district was off for a few days. Wow. Glad it was summer and not too cold! Smart alec replies aren’t always a good tactic. As I left the USSR, the interview in customs and security was taking a really long time. Seemed my itinerary was especially confusing for the guards. They couldn’t understand weeks of time in Volgograd with just a couple of days in Moscow and no time in Leningrad/St. Petersburg. I was calmly answering questions, giving them only the info they asked for as friends who had traveled there warned me about volunteering too much. At a certain point the guard left my interview and left the line waiting. He came back and asked if I had a card from my university since I was doing studies. I gave it to him and he saw the word “journalism” and went back to the manager. They talked for a while and then came to ask me a few final questions. I was thrilled when he said I could go and handed me my documents. After I had taken a few quick steps trying to make my flight, he called to me to say I had forgotten my business card. I replied with something like “you can keep it and get in touch if you ever get to the US” and kept walking. The guy behind me started laughing…. God only knows whether he was able to get through security that day! Writing my thesis as the Soviet Union falls apart. The timing was unbelievable. I went over in May of 1991 and spent the rest of the summer trying to write my thesis. This meant sitting in front of the TV as I watched the August coup become an uprising that resulted in the end of the Soviet Union and the solidification of Russian nationalism. Boris Yeltsin made a stand at the Russian White House and I was entranced. I wasn’t sure whether I should write fast or whether this would nullify my research. Turned out a great time capture. What was your first big trip solo? What lessons did you learn? It must have been so amazing to be there at that time. My friend went over a few years later and spent a summer studying at the University of Moscow – he had some stories to tell, that’s for sure. Just so interesting. Agreed. I would love to go back and do some comparing of things. The vibe was so incredibly positive (well except for the exit interview LOL). Its amazing how many friends I’ve heard from who went to Russia back then and yet we weren’t friends at the time nor had we ever happened to learn we had that in common. It’s pretty cool to talk about it all these years later!